Duck Vs Goose Vs Alternative Down: Which Is the Superior Pillow Filling? 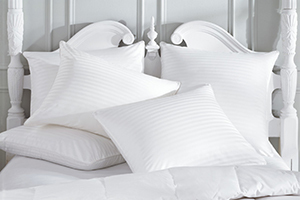 The choice of pillow filling is driven by both personal taste and practicality. Factors such as comfort, durability, cost, taste, season of the year/weather conditions and medical conditions need to be considered before plumbing for a given choice of pillow filling. The choice of filling material will not only influence the quality of sleep but also your health and level of productivity. Below, is a demystification of the qualities, pros and cons of the main pillow filling options. 4 Thinking of Alternative Down? Down or down clusters are the three dimensional plumage found under the belly and chest of ducks or geese. They lie beneath the belly feathers and offer nature’s best insulation against heat loss. Unlike feathers, which have a spine from which fibers sprout, downs have a center core from which its fibers sprout. Their three dimensional nature allows them to trap air thus retaining heat while allowing for efficient evaporation of moisture. Duck down are harvested from ducks slaughtered for the dining room table. According to Matt Heid ,the fact that ducks are more widely consumed as compared to geese affects its availability and cost. Comparatively, this availability means that duck down is cheaper than geese down. Duck down however, tends to have a lower fill power than geese down and therefore used in lower end pillows. By fill power, we refer to the volume occupied by an ounce of down. High quality fill will occupy higher volumes with low quality fill occupied a limited volume. Additionally, duck down tends to pose a challenge to individuals with highly advanced olfactory glands. Given that, ducks are slung lower than geese, their bellies tend to interact with the ground more than those of the geese do. In this contact, numerous ground odors are absorbed which can present a challenge to users. Although the manufacturing and cleaning processes eliminate most of these odors, individuals with sensitive olfactory glands have been known to pick up scents from duck down. Geese down are the pinnacle of downs for pillow filling. They hold several advantages over both duck and alternative down. Due to the less widespread demand for geese however, it is rare and therefore more costly. The fill quality of geese down is first class given that geese are larger than ducks. Their down is therefore larger due to larger plumules and an ounce will occupy a larger volume than that occupied by ducks. It is therefore used for high-end pillows and comforters. Additionally, given the higher clearance between the geese’s’ belly and the ground as compared to the duck, they tend to have less odor. This makes them better suited for individuals with advanced olfactory abilities. For several reasons, mostly health related, individuals will require alternative down. As the name suggests, this is pillow fill made of down alternatives mainly composed of synthetic materials. For a better review, virolinens.com has a detailed analysis of pillow fillings that includes specific brands, their reviews and pricing. According to Bedding Care , the main advantage of synthetic down is it’s hypoallergenic and bacteria inhibiting properties. Most individuals opting for alternative down do so following prescriptions from doctors. These features will offer those allergic the opportunities of a sniffle free sleep. It is important to note The Company Store’s assertion that some natural down from geese and duck are also hypoallergenic. This is achieved during a rigorous purification process before they are used in the pillow. Another positive of alternative down is its tendency to be firmer than natural down. Whilst natural down from ducks and geese tend to take the shape of the head, synthetic alternatives are fluffier and offer more resilient. However, alternative down is less superior to natural down on the matter of insulation. The softer more organic duck and geese down are warmer than their synthetic alternatives. Generally, geese will offer a higher quality of down compared to duck. However, older ducks will offer better quality when compared to young immature geese. It is advisable to analyse the relationship between the quality of down and the type of bird from which the down was acquired. The climates in which the bird exists will also determine the quality of down they produce. Generally, animals from cold regions will offer better down than their contemporaries in warmer climes. Objectively speaking, downs can be ranked in ascending order from alternative down, to duck down and lastly geese down. However, the choice of a pillow is a personal and highly subjective matter. Individual taste and preferences mean that the standard rules do not always apply. The suitability of different downs given the weather and other variables has been extensively analyzed by suitability. Before making a choice of down for your pillow, research widely and if possible try out some of the products you are considering. For those with allergic conditions, pay special attention to the hypoallergenic and anti-bacterial properties of the pillows you encounter. 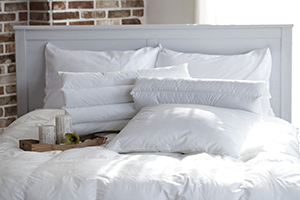 Choose the pillow that suits your sleep pattern, the weather conditions and your budget. This entry was posted on May 27, 2017 by Carrie Gutierrez.